Map of The World Illustrating The Principal Features Of Meteorology. Map of The World Showing the Distribution And Limits of Cultivation of The Principal Plants Useful to Mankind. A beautiful 1855 first edition example of Colton's map of the World's principal plants and features of meteorology. The map is divided into two parts. 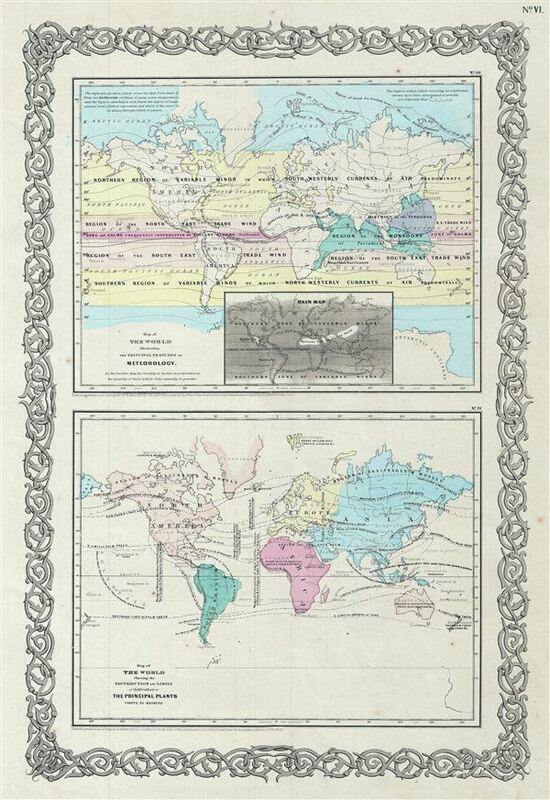 The upper map illustrates the principal features of meteorology across the world. The lower map shows the distribution and limits of cultivation of the principal plants useful to mankind. The upper map also includes an inset rain map. Color coded according to various wind currents, continents and countries are labeled, but their political boundaries are not shown. Small paragraphs on the top left and right corners contain information about the markings on the map. A short paragraph below the title explains the marking on the inset map. The lower map is color coded according to continents. Here also continents and countries are labeled but their boundaries remain unmarked. It marks the areas of various plant species. Surrounded by Colton's typical spiral motif border. Dated and copyrighted to J. H. Colton, 1855. Published from Colton's 172 William Street Office in New York City. Issued as page no. VI in volume 2 of Colton's 1856 Atlas of the World. Rumsey 0149.004 (1856 edition). Phillips (Atlases) 816.